I hear you, I hear you. You are sick of reading about my Europe trip because that's all I blog about since May. And just when you thought your prayers were answered when you read about the loss of my photos because of some copy error and memory card malfunction, I am telling you now that my prayers were answered instead because the technicians working on the cards said they need the weekend to transfer all my photos into a CD because there are thousands of photos that are recoverable. I am keeping my fingers crossed that the missing photos are among them. So it looks like I can continue to bore readers until September after which I go to Shanghai and have more travel tales. Earthlings have learnt that everything on the computer is recoverable, thanks to Edison Cheng. But did you know that data on memory cards are recoverable? The photos you took of your private moments/anatomy are recoverable even if you've deleted them so don't be so naive, boys and girls. And be careful too about the photos on FB because prospective employers hire people to check on your raunchy parties/lifestyle photos/nasty comments you make about your present parents/boss/exes. Before his sister left for Melbourne to finish up the last 4 months of her master's degree (she seems to have been in uni forever! Time to get out and earn $, Yi! ), Wey and sis had a cook out. Wey made his own fettucine carbonara with the pancetta I bought in Pisa while Yi cooked up some crabs with eggs and ginger, a dish her aunty in Shanghai impressed her with. 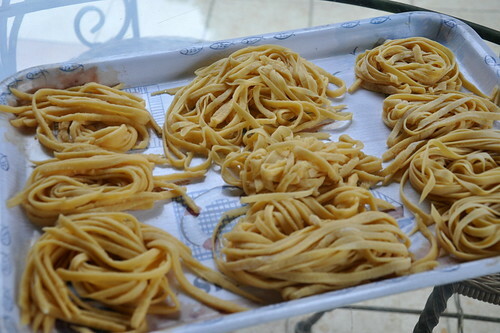 He made these pasta effortlessly and quickly too. 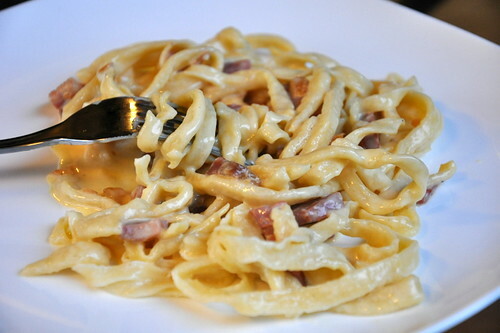 Wey likes his carbonara with cream. I prefer mine without (less calories) but this was perfect. Yi's crabs with eggs and ginger was very delicious. I need this recipe, Yi. 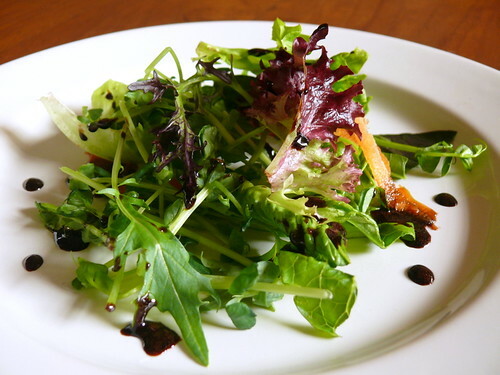 I now prefer my salad with balsamic glace which is slightly thicker and sweeter than balsamic vinegar. I've tried making balsamic glace a couple of times and sometimes the result is good sometimes not. Basically just boil balsamic vinegar with a bit of sugar or even honey until it's slightly thicker. You can add olive oil or serve it separately. I much prefer it to plain balsamic vinegar which can be too sour. Not to be left out on the culinary scene, my son Ming won Monash University's first Masterchef Student Competition last Friday. From a pool of about 20 participants, 5 made the finals. Ming called me the day before his semi finals to tell me about the competition and asked for advice on burgers. Two days later was the finals and he didn't call to discuss his menu or recipe. I'm glad he didn't consult me because he was good enough on his own and came up with lamb cutlets seasoned with rosemary and marinaded in--prepare for this--coca cola! He said the coke tenderized the lamb and gave it some sweetness. Way to go, Ming! Now you still have to finish your degree in Engineering. And please get some dancing lessons. I hope Hub now feels pressured to cook more than his egg and garlic fried rice, which the kids love. Growing up, the kids violently rejected his tuna and peanut butter sandwiches and he found the only thing he cooked that they would eat was his fried rice. Your kids are high achievers! Masterchef at Monash. No easy feat. 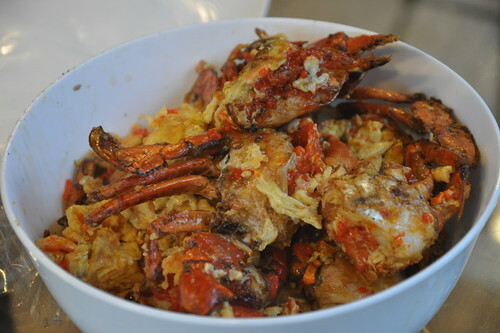 Can Yi share the recipe of the crab with eggs and ginger? It looks simple but utterly delicious. I have fond memories of Melbourne, seeing half of my friends live there. In fact, we were planning to move there until our UK visa came through so we thought we'll try Europe first. BTW, I'm constantly checking your blog for updates regarding your European trip. I'm living vicariously through you. I'm not sick of the Europe updates! Post more!!! And congrats to Ming! :) I'm gonna try marinating my lamb chops with coke too. ccc: thnx:D. you must encourage your kids to cook when they are young. yi's so busy i think it'll be a long time b4 we get the recipe. i think i'll have a better chance getting it in shanghai. haha, don't live vicariously, you can travel europe anytime where you are! heather: really? then you shall get more! yes yes, let's have a big cooking fest when you get back. when though are you coming back? year end is good, or CNY. yes, aus is def a better place to live i think even tho as my girl now puts it, it's very "crocodile dundee" after europe! LOL. No, hubby's definitely not a billionaire (I wish) nor in medicine. With 2 doctors and 2 nurses in the family, I think that's enough without Steve joining in. We don't live in London. Having stayed briefly with an aunt there, I knew that it was no place for kids. I love the city but couldn't handle the pollution, masses and traffic. Where we are is fantastic. Surrounded by rivers, hills and parks but only an hour away from London. We are New Zealand citizens so going to live in Australia is not a problem. We're lucky in that sense. d love to live near rivers! don't tell me there's fishing too bc i'll die of envy! Well, Hampshire's actually famous for their trout fishing and watercress. In fact, a village not far from where you are has the Itchen river flowing through. You can see the big fat trout right in the town center all viewing for attention! I mean, where we are. Sorry!